REDDING, Calif. - British choral music and poetry will be the focus of A British Choral Concert, presented by the Simpson University Music Department at 3 p.m. Sunday, Oct. 26. 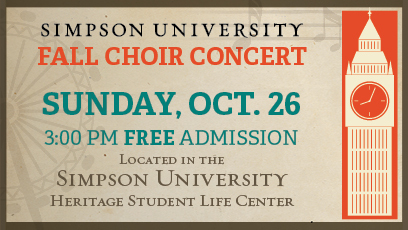 The Simpson Chorale and Trinity Repertory Singers will present the free concert inside the Heritage Student Life Center on campus, 2211 College View Drive. It will feature famous works from British choral music, venturing into genres that include motets, madrigals, catches, anthems, and more. Featured composers include Stanford, Handel, Byrd, Britten, Morley, Vaughan Williams, and Rutter. In addition, Britons who live in the Redding area will read British poetry aloud. The event will culminate with an English tea reception. For more information, call (530) 226-4507 or email sumusic@simpsonu.edu.